Hello, our support team is ready to present you a new tutorial that shows how to make your WordPress blog completely private. A private WordPress blog can be used for sharing your family events, wedding photos, baby pictures, with friends and family. A private blog can also be used as your own private diary or journal. You can also use private blog for a classroom website or site of team working on a same project. First thing you need to do is install and activate the My Private Site plugin. Once plugin is installed and activated you need to visit Settings > Private Site page to configure the plugin settings. Check the box under Make Site Private section to enable the plugin and make your site private. Next section gives you a possibility to allow users to register on your WordPress site. If you don’t want users to be able to register on your site, then you can skip this section. In Landing Location section you can choose which page users will be redirected to when they login. By default, the plugin will return them to the same URL they requested before login. Alternatively, you can redirect users to the homepage, WordPress admin dashboard or any other URL on your WordPress site. You need to make changes in Custom Login page section only if you are using a custom login page. Simply check the box, and provide the URL of your custom login page. WordPress engine also comes with a built-in feature which allows you to make posts or pages private and password protected. On the post editing screen find Visibility option under the publish meta box. Click on the Edit link next to visibility. 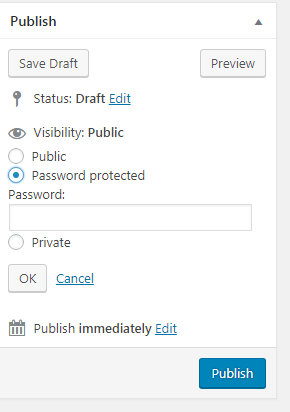 There you will see the options to make a post Private or add a password protection to the post. Choose the appropriate radio button to make a post private or password-protected. Also, make sure to browse the collection of other WordPress themes.